come up with whatever blocks that fit monthly themes. kind, encouraging, and friendly everyone is in this bee. I am loving this bee even more!! by everyone so far. The Beatle's "Please, Mister Postman"
(above) would be a great song to listen to while you ogle these blocks! A stack of packages by Corey of Little Miss Shabby. 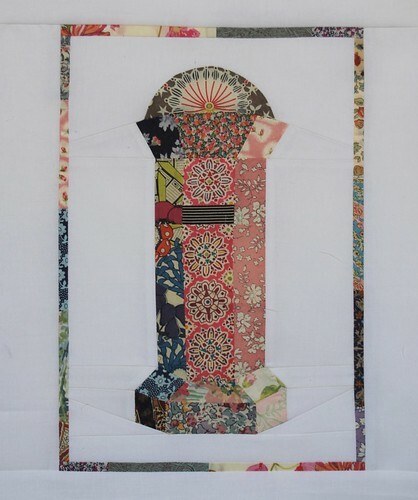 Liberty letterbox by Lynne of Lily's Quilt. Colored pencils by Kerry of verykerryberry. 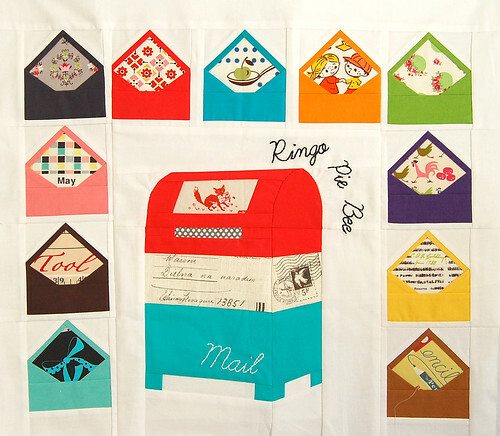 Vintage envelop etc by Lucinda of Septemberbird. Washi tape and wonky pencils by Amber of One Shabby Chick. 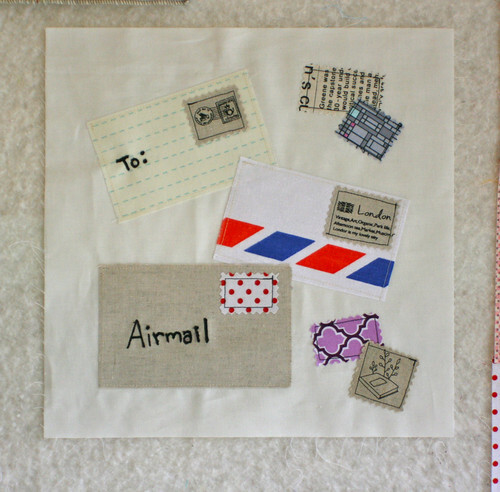 Airmail by Amber of One Shabby Chick. 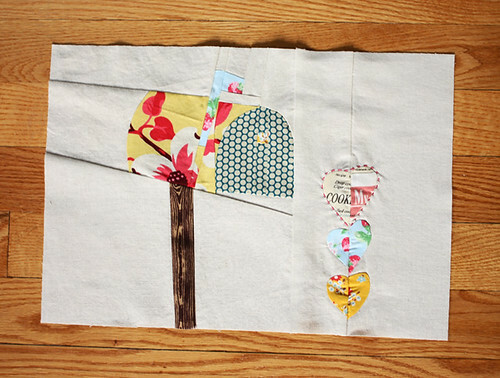 Carrier Pigeon by Marit of Quilt it. 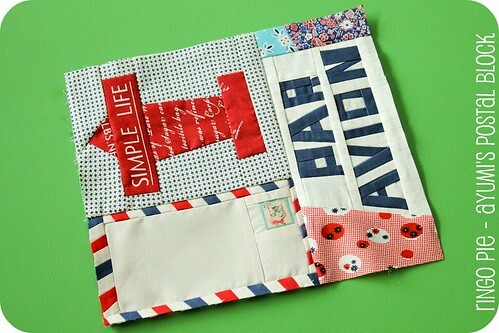 Airmail and plane by Amy of Badskirt. I know I know I know I know!!!! These blocks are crazily amazing, right? !My quilt is going to seriously ROCK! 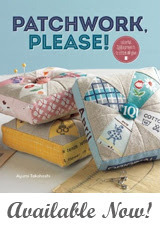 !In fact, maybe I will enter this quilt atTokyo Quilt Festival if I do a great job atmaking them into a quilt. hehe, a girl can dream, right? Thank you for letting me share my excitementover these blocks with you, and thank you so much forall of you who made a block for me or are going to make me one.I love them all and I do know I will love those that are coming. P.S. my fabulous friend Kerry is having a 'My Secret Obsession' party where we allshare our secret obsessions on our blogs!Go ahead and join the fun! My thinking capis on. I'll come back with my obsessions, hehe. 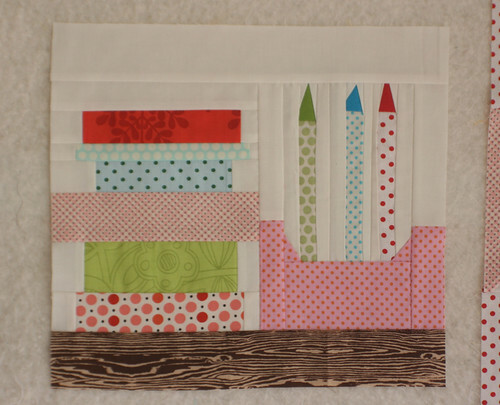 These blocks are amazing...and what a fun theme!! Can't wait to see the finished quilt! 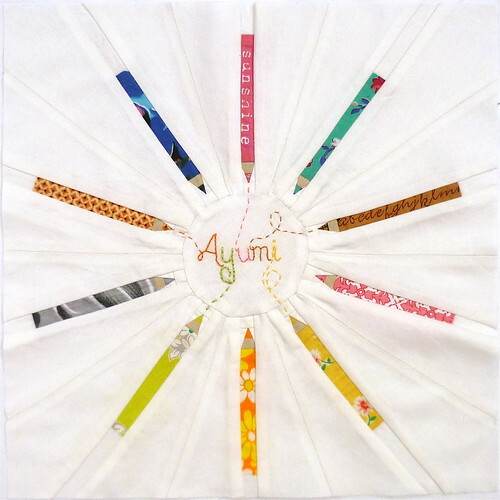 Oh my Ayumi!!! You lucky (and very deserving girl)!! I love every one of them, but I must say that "Carrier Pigeon" totally cracked me up. What a fun idea. You chose a wonderful theme and it looks like everyone had a great time creating for you. Um can I just say wow! Crazily amazing. Perfect description. I have been watching these here and on flickr. This was a brilliant idea. Hugs! so amazing!! have fun, can't wait to see what you do with them all! Wow! This is the best block bee ever!! These blocks are so fantastic. I love every single one and they are all so unique. You are one lucky gal to be in this bee. What a beautiful collection of blocks! They are so thoughtfully made. 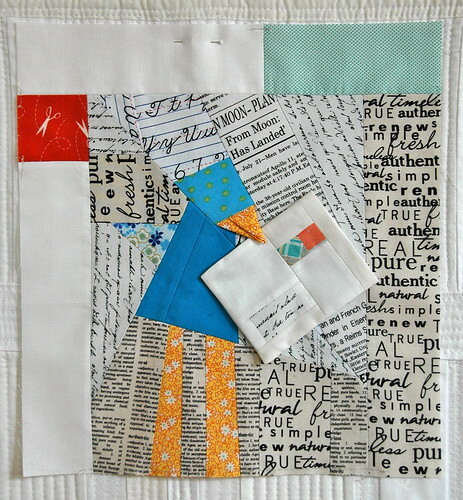 They all look so great together and very harmonious- they will combine beautifully in a quilt! 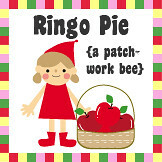 And thankyou for the linky mention- you are a honey! 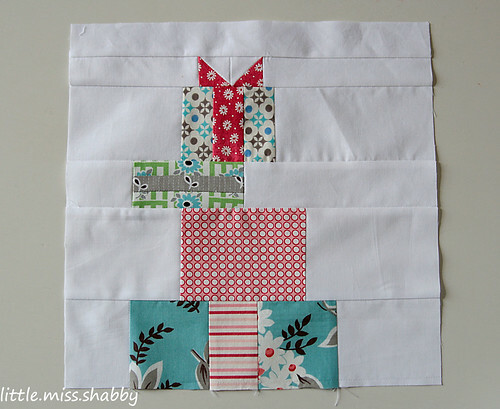 Fabulous blocks - AND a cute penguin! The Beatles weren't bad either! These are some of the cutest blocks I've ever seen, I love the theme. You are one blessed girl to get all of those wonderful blocks, they are the best! They are all amazing, love yours and I also love the liberty letterbox!! So creative - they will look brilliant together in a quilt. The coloured pencils, airmail and airmail and plane are absolutely fabulous. I reckon you can enter the comp for sure! Lots of talent in those awesome blocks! Wow! The colored pencils are AWESOME! Going to be such a cool quilt! OMG! i practically dribbled and drooled when i saw the coloured pencils by kerry! Oh man...i want one too!!! SooOOo JEALOUS! Arghh! Can't stand it! Eeee! simply beautiful............i love the originality. So pure and so clever. Thank you for sharing. Amazing! I need to think outside of the square! Shop smart for the best car deals online. When you are shopping for a car online beware of fraudulent vehicle sales. Use trusted car buying sites like eBay Motors. Don't pay for a vehicle online using a wire service. Get more tips to protect yourself and your money.Engine Coolant Is A Year Round Concern so make sure you check your car's coolant levels on a regular basis. Antifreeze/coolant keeps your engine's cooling system from boiling over in the heat and freezing in the cold.Underground Racing is all about speed and supercars. Find out more about this Charlotte, NC based tuner shop that specializes in custom-built turbocharing and supercharging systems. 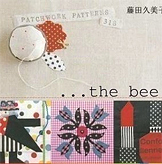 Thanks for this pattern galore ! I love it so much. do you have more?